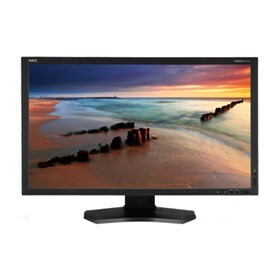 The NEC P242W-BK is an 24” widescreen display monitor ideal for web, high-end desktop and photography applications. This monitor features an AH-IPS panel for great imaging performance. Also Offers 99.6% coverage of sRGB color gamut and 75.2% of NTSC. The P242W provides professional-grade benefits, such as an internal 14-bit 3D programmable lookup tables (LUTs), DisplayPort connectivity and built-in USB hub, at a budget-friendly price. The NEC P242W-BK has many exciting features for users of all types. See the NEC P242W-BK gallery images above for more product views. The NEC P242W-BK is sold as a Brand New Unopened Item.